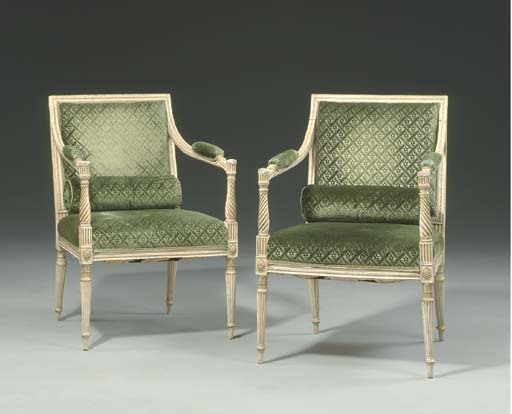 The beaded frames and ankles on these chairs relates to decoration found on models by Thomas Chippendale. A set of sixteen armchairs by Chippendale, of more rounded overall form but utilizing the same beaded embellishment, were supplied for the salon at Burton Constable in 1774 (see C. Gilbert, The Life and Work of Thomas Chippendale, New York, 1978, p. 112, figs 192-194). This feature can also be seen on a set of fourteen armchairs, with similar rectangular 'tablet' backs supplied by Chippendale for the White Drawing Room at Harewood House (see Gilbert, ibid. p. 114, fig. 199).